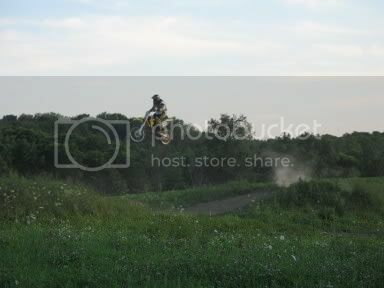 humm there is grand bend motorplex track its pretty good fun jumps and stuff but it is usualyy always hard packed. whats wrong wiht hard packed? Your Either On It Or Behind It. Brand new track open now just west of wingham on 86 hwy. Track is open monday-saturday. Was built by chick and is the most fun track I've ever ridden. Lots of jumps and Chris will keep it in mint shape. There is something there for everyone. Kids track is kind of small but still fun for my little guy. "CD performance" is the business that he is going to open on the property. directions hwy 86 west of wingham, Ontario on left side of road if you get to whitechurch you went too far. The track can be seen from the road. Tell Chris Macdog sent ya. Pics I don't have, would know how to post them anyways. The layout is very good, He made very good use of natural elevation changes, The jumps are professionally built by chick (tracks by chick). There are some challenging sections, Altough most all the triples are easily doubled or singled if preferred, the dirt is dark loam with no rocks, The one section includes a hill climb horseshoe which is riddled with rocks (like motopark) but I beleive that it adds something to it. I beleive that the track justifys the cost. I race intermediate and I love this track. Hey guys,just got back into riding again,my 7 yr old is riding as well,use to hit motopark,double Bs and barrie as well,what r some good tracks for kids learning g how to ride?wanna get him ripen this summer again and I wanna hit some nice tracks as well,any recommendations?